More than 40 employers have signed up to SkillsCymru, Wales’ largest careers fair, with the hope of recruiting fresh talent from across the country. The events, which are free to attend, will be happening on 4th and 5th October at Venue Cymru, Llandudno, and on 11th and 12th October at Motorpoint Arena in Cardiff, and are expected to attract more than 10,000 young people, graduates and job seekers. SkillsCymru is an annual event and is supported by the Welsh Government as part of its commitment to promote skills in Wales and inspire young people to investigate the variety of different careers and vocational routes available to them. The careers fair will include employers from a variety of sectors showcasing careers and vocational courses. There will be a variety of interactive stands including the Welsh Government’s ‘Get Skilled’ areas, which will feature activities based around different business sectors. The event will also feature a careers information evening for parents, which will be hosted on the 4th at Venue Cymru, and the 11th at the Motorpoint Arena. This year will see more employers making use of digital technology and virtual reality (VR) headsets to help give jobseekers and pupils an interactive and realistic taste of the careers on offer. This includes the Welsh Government’s ‘Have a Go’ equipment, which aims to encourage greater engagement from school children in vocational education including Apprenticeships. Young people will be able to try out new skills on a range of fun and interactive activities across six key business sectors, including having a go on a virtual welder, a JCB simulator and a 3D scanner. The British Army will also be exhibiting at both the North and South Wales events and will be bringing along their Oculus Rift VR equipment. These headsets simulate a range of different environments, from adventure training in the peaks of Snowdonia and attempting a parachute jump, to experiencing urban combat and getting behind the wheel of a tank. 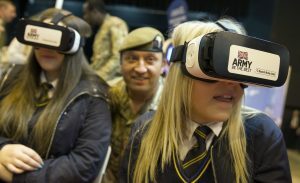 Siobhan Penrose, head of marketing campaigns, Defence Recruiting Services, said: “Our VR headsets help to give people a glimpse into the variety of things soldiers might experience, and gives them a taster of what it takes to be a part of the British Army in a completely immersive and interactive way. “We’ve been using the headsets since 2014 and they always prove popular at careers events like SkillsCymru. Last year, we had a lot of interest from visitors to SkillsCymru and they acted as a good conversation starter for those who hadn’t necessarily considered a career with us, but just wanted to try the equipment. “Often, people think the only job a soldier does is serve on the frontline, but there are, in fact, hundreds of careers on offer within the Army, such as musicians, logistic specialists, chaplains, nurses, HR specialists, engineers and vets. “The Army has the largest apprenticeship programme in the UK, with around 95% of new soldiers taking part and more than 8,000 completing their apprenticeship training each year. There are also more than 500 different qualifications available to soldiers, from GCSE to degrees, including all kinds of professional and practical qualifications in areas such as chartered engineering and accountancy. Also at the events will be NHS Wales, ALDI, Arts Council of Wales, Wales and West Utilities and Horizon Nuclear Power – which will be promoting its recruitment programme to fill roles at its Anglesey power plant, Wylfa Newydd, and is expected to create 850 jobs. Minister for Skills and Science Julie James said: “SkillsCymru is an important event in the calendar for young people looking to research their next steps. It is also a useful opportunity for parents to find out more about vocational routes into work, such as apprenticeships, at the information evening on the first days of both events. Both SkillsCymru events are free to visit. They are being organised by Prospects and Cazbah, with support from the Welsh Government, and are part-financed through the European Social Fund.